The music industry’s iron-clad grip on digital rights management (DRM) encryption is starting to loosen. Today, Warner Music Group announced they will follow the path blazed by EMI, and then adopted by Universal Music. Effective immediately, they’ll sell their music DRM-Free through certain retailers (e.g. Amazon and not iTunes). For the better part of the past few years, the Big 4 music labels, which represent the majority of music sold at retail, have embraced a digital encryption strategy for the sale of their music online. Up until last year, any song sold online as a digital download from the big label’s catalogs had to be encrypted with digital copyright protections to protect against unauthorized duplication. The industry required it as terms of license. The apparent theory was that digital files were too easy to pirate. The burden of encryption, theoretically, would mitigate that risk. The strategy, however, proved flawed. As a first paradox, much of the music sold in the world was on CD’s which were already DRM-Free. Additionally, the contracts and structure of the encryption environment, coupled with Apple’s dominating consumer success with the iPod, created an environment that gave disproportional power for one seller (Apple) over others (anyone else). Under the restricted DRM encrypted approach Apple sold songs playable on the iPod. No other retailer had access to the same encryption (and with it, the ability to sell music playable for iPod owners). These other stores, instead, sold Window Media encrypted songs playable on other devices. With the iPod dominating, many of these music stores failed including Virgin Digital and Sony Connect. [More Info: A More detailed look at the paradox of the Music Industries DRM Strategy and how it helped build iTunes can be found here in related articles here and here or in the list or related articles at the bottom of this article]. Like Universal, WMG’s new DRM approach will also bypass iTunes. Instead, WMG will embrace Amazon where they have greater pricing latitude. (Amazon allows the label to price music with some variation. Apple, in contrast, insists on a strict single price schedule for iTunes and restricts a label’s ability to bundle music or reprice it for sales and promotions). 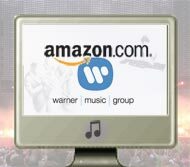 In their deal with Amazon, WMG’s music is available immediately. Of the Big 4, now only Sony BMG lacks a DRM-Free catalog. Speculation, however, suggests they too will follow the industry and accept some form of open DRM-Free sales as early as January or in the first half of 2008. Since opening in September, Amazon’s MP3 store has grown to house the largest selection of DRM Free MP3 music in the market. All of the more than 2.9m songs in their catalog are sold without encryption. Priced at 89c to 99c a song, all songs will play on any portable device, from iPods to Zunes. More information on DRM Issues and the music industry including detailed background, the issues at stake, and info on EMI’s trailblazing approach can be found in the following Related Articles.